These accommodations are some of the finest rooms Ocho Rios offers and our location, rates and amenities makes us one of the best hotels in the area. 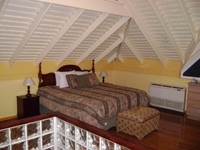 The legacy of The Crane Ridge Resort and the quality of their self catering units have established us as a villa in Ocho Rios offering multiple lodging options for exceptional guest conveniences. Located on the second floor and comprising of two levels, offering a unique experience to the accommodations we offer. The suite’s lower level is an exact duplicate of the Deluxe Ridge Suite’s layout they boast white French style doors, wooden Louvre windows and are fully air conditioned. The layout takes up 1200 sqaure feet encompassing two levels. A spacious living room which also features a modern kitchenette, offers amenities which include a ceramic cook-top, coffee maker, toaster, microwave oven and a refrigerator. The living room features the suite’s television set, sofa and coffee table. An adjoining bedroom featuring a queen sized bed, safety deposit box, private bath/shower facilities and a balcony which is accessible from both the living room and the bedroom completes the suite. A spiral staircase in the living room leads to the loft. The Loft area features the suite’s second formal sleeping area, which comes complete with a king sized bed, walk-in closet and private bathroom. These suites are fully air conditioned an may be found on the ground and first floors, they boast white French style doors, wooden Louvre windows and are fully air conditioned. A spacious living room which also features a modern kitchenette, offers amenities which include a breakfast bar, ceramic cook-top, coffee maker, microwave oven and a refrigerator. The living room features the suite’s LCD television set, sofa and coffee table plus a day bed for extra guests when sleeping in excess of two persons. An adjoining bedroom featuring a king/queen sized bed, complimentary safety deposit box, private bath/shower facilities. There is a blow dryer, iron and ironing board for guest use as well. A balcony which is accessible from both the living room and the bedroom completes this suite. These suites are located on the ground and first floors and are 700 square feet in size. They boast white French style doors, wooden Louvre windows and are fully air conditioned. A spacious living room which also features a modern kitchenette, offers amenities which include a breakfast bar, microwave oven and a refrigerator. The living room features the suite’s television set, sofa and coffee table plus a day bed for extra guests when sleeping in excess of two persons. An adjoining bedroom featuring a queen sized bed, full private bath/shower facilities and a balcony which is accessible from both the living room and the bedroom completes the suite. These rooms are located on the ground floor and are 325 square feet in size. They feature 1 Double bed, FREE wi-fi, cable/satellite TV, bathroom with tub/shower, toilet, hairdryer-on request, and a mirror. There is also air conditioning, a dresser with a stool and a shared balcony. Accommodations may sleep one small child with two adults with the existing bedding or if customer is traveling with a small crib. They have no kitchens or refrigerators nor is there the capacity for extra beds in these units. stay policy may also apply. All accommodations are subject to availability. Photos are purely representational, but not far from the expected layout, decor and furnishings of rooms offered.